Review posted April 6, 2018. 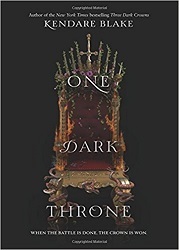 I read Three Dark Crowns last year for the Cybils awards, so I wanted to find out what happened next. Unfortunately, I had trouble remembering all the characters and all the situations – the author doesn’t do a whole lot of reviewing. This fantasy series is a cross between a typical fantasy kingdom and The Hunger Games. In this world, each generation three queens are born as triplets. When they come of age, they have a year to kill each other. The one queen remaining at the end of the year will rule the island under the Goddess until she gives birth to triplets herself. Arsinoe, who has been brought up with the naturalists, has surprised everyone – but she is harboring a secret. And Mirabella, who was once considered the certain winner, seems at a disadvantage. Since the author has made you care about all three queens and the people surrounding each one, the reader definitely doesn’t want any of the queens to die. But they must. This story was a little more confusing to me, because of the aforementioned forgetting of details from the first book. I’m not crazy about this bloodthirsty island. I’ll say only that people you care about die in this book. However, the story is not finished. The author has spun an inventive fantasy, a world that’s unique and complex, however bloodthirsty. Because you’re seeing the world of each one of the three queens, there is a large cast of characters, though – which is what makes it difficult to remember details after a year away. There’s lots of intrigue going on, and she does make you want to find out what happens next. I think I almost want to recommend reading these books when the series is finished, so you aren’t prone to forget the previous book when you start the next – then take them all up in one binge of reading. I do hope that the final volume will make the journey worth it. And I probably won’t be able to resist finding out (depending on how much I’ve forgotten by then).